2017-05-24T09:57:43.081308Z 0 [Warning] Next log extension: 2147483641. Remaining log filename extensions: 6. Please consider archiving some logs. 2017-05-24T09:57:43.090250Z 0 [Warning] Next log extension: 2147483641. Remaining log filename extensions: 6. Please consider archiving some logs. 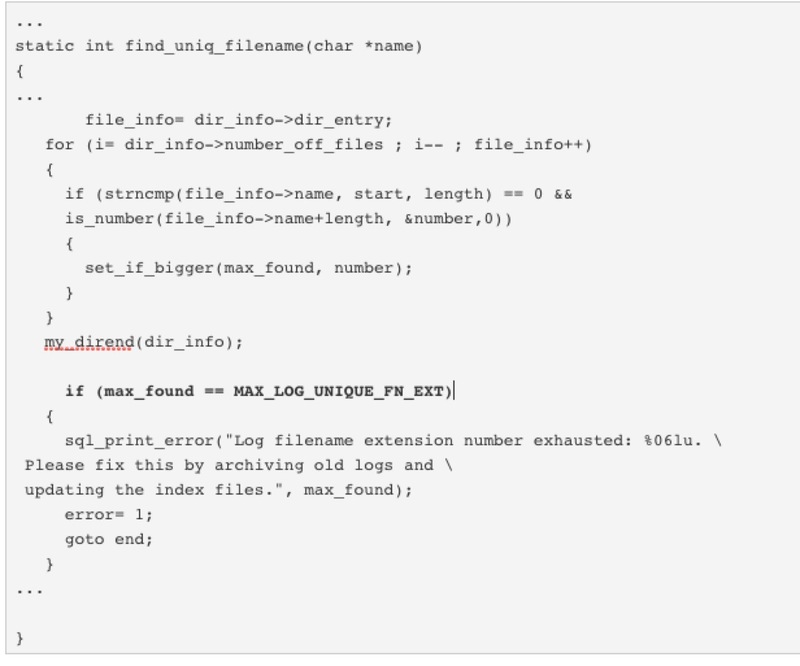 ERROR 1598 (HY000): Binary logging not possible. Message: Either disk is full or file system is read only while rotating the binlog. Aborting the server. 2017-05-24T09:59:08.207040Z 3 [Warning] Next log extension: 2147483642. Remaining log filename extensions: 5. Please consider archiving some logs. 2017-05-24T09:59:09.970075Z 3 [Warning] Next log extension: 2147483643. Remaining log filename extensions: 4. Please consider archiving some logs. 2017-05-24T09:59:10.882140Z 3 [Warning] Next log extension: 2147483644. Remaining log filename extensions: 3. Please consider archiving some logs. 2017-05-24T09:59:12.050605Z 3 [Warning] Next log extension: 2147483645. Remaining log filename extensions: 2. Please consider archiving some logs. 2017-05-24T09:59:14.090312Z 3 [Warning] Next log extension: 2147483646. Remaining log filename extensions: 1. Please consider archiving some logs. 2017-05-24T09:59:26.483618Z 3 [Warning] Next log extension: 2147483647. Remaining log filename extensions: 0. Please consider archiving some logs. 2017-05-24T09:59:34.894426Z 3 [ERROR] Log filename extension number exhausted: 2147483647. Please fix this by archiving old logs and updating the index files. 2017-05-24T09:59:34.894668Z 3 [ERROR] /usr/local/mysql/bin/mysqld: Binary logging not possible. Message: Either disk is full or file system is read only while rotating the binlog. Aborting the server.